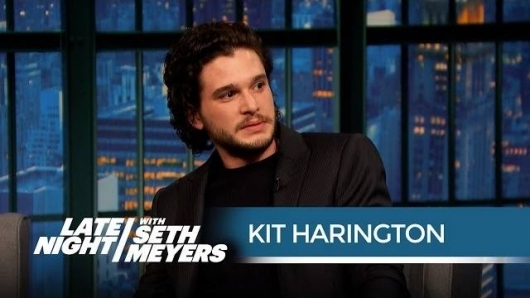 Game of Thrones star Kit Harrington, who plays Jon Snow of The Night’s Watch, visited Late Night with Seth Meyers last night in anticipation of the Season 5 premiere airing Sunday, April 12th, at 9pm ET on HBO. Check out the videos of his appearance here below, including one where host Seth Meyers brings Jon Snow to a dinner party. Fresh off the heels of NBC’s broadcast of the one-hour series finale of Parks and Recreation last night, the cast of the long-running sitcom made an appearance on Late Night With Seth Meyers to reminisce about their experience filming the final episode, while star Chris Pratt revealed how he thought the series should have ended. At the end of the night, host Seth Meyers joined in with Parks and Rec co-creator Michael Schur and the cast — Amy Poehler, Adam Scott, Aziz Ansari, Rashida Jones, Aubrey Plaza, Nick Offerman, Retta, Jon Glaser, Jim O’Heir, and a guitar-playing Chris Pratt — for a tear-jerking rendition of “Bye, Bye Li’l Sebastian,” complete with lighters held high. 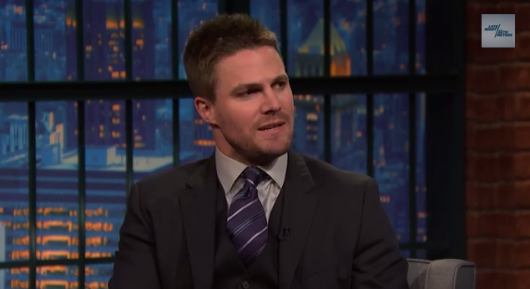 Check out the cast singing on Late Night here below. 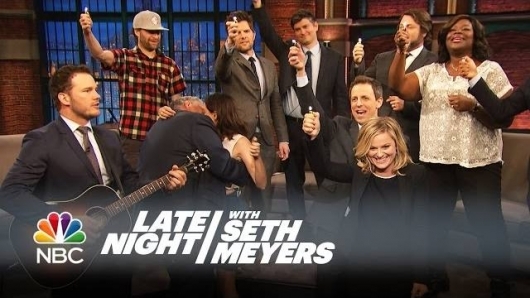 The cast of NBC’s Parks and Recreation made an appearance on Late Night With Seth Meyers on Wednesday night soon after the show’s one-hour series finale aired. Stars Amy Poehler, Adam Scott, Aziz Ansari, Rashida Jones, Chris Pratt, Aubrey Plaza, Nick Offerman, Retta, and Jim O’Heir, along with co-creator Michael Schur, talked about their thoughts on ending the show after 8 successful years on the air. Obviously, it was an emotional time for the cast, but main star Amy Poehler was rapid-fire funny throughout the interview, while Chris Pratt revealed how he thought the series should have ended. Check out the video here below, which includes Pratt’s pitch for the series finale.